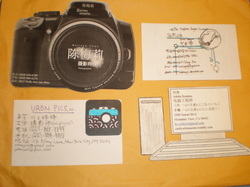 As we learned the names of the different jobs in Chinese, we made personalized business cards that reflected our dream job. In the future, I see myself being a photographer. As Halloween came, Ms. Tung taught us about Halloween in Chinese. 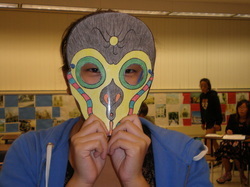 We each designed a Chinese Halloween mask to celebrate the holiday. 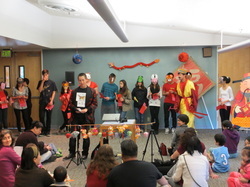 Here is a picture of the play that some of Ms. Tung's students put on about the story of the Chinese Zodiac at the Los Altos Public Library. 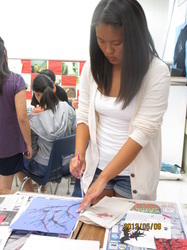 This is a picture of a paper dragon made by student Melissa Chan. 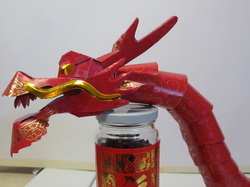 The paper dragon symbolizes the animal representing this year, 2012. 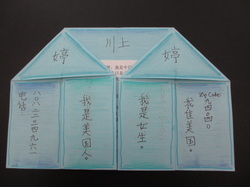 This is a picture of red envelopes are often given to the younger generation by adults. 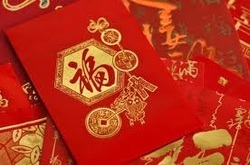 They contain money and symbolize good luck. This assignment was designed to help students learn how to write, read, and say the dates of months. 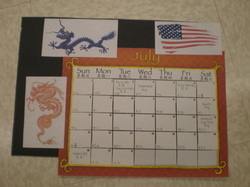 Students were asked to make their own calendar of an assigned month and include important holidays and dates. To develop our speech-giving skills in Mandarin, Ms. Tung assigned us a project requiring us to act as a famous person that we admire. I chose to become Andrew Luck and gave a speech about his life, career, and achievements. 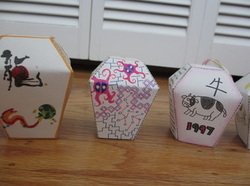 清明节 or Tomb Sweeping Day is a traditional Chinese festival, which occurs around about early April. Tomb Sweeping Day is on the first day of the fifth solar term, which is called 清明. Tomb Sweeping Day is a day for people to go outside and enjoy the newly-arrived spring, and for people to pay respect to their lost loved ones. The Cold Food Festival begins the day before Tomb Sweeping Day and continues for two more days. During this holiday, people do not use fire to cook, so people eat Spring Rolls, which consists of fresh vegetables. 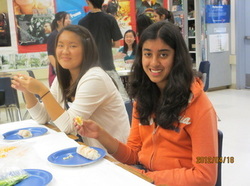 In class, we had the oppurtunity to make spring rolls and celebrate Tomb Sweeping Day and Cold Food Festival. 元宵节 or the Chinese Lantern Festival occurs on January 15 or the first full moon of the year. On this day many people go to the temple to pray for a good new year and like lanterns in spirit of the celebrations. On this holiday, many people eat 元宵 or rice balls believing that the roundness of the food and the bowl that they are served in symbolizes a family's togetherness. 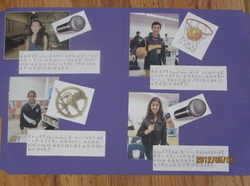 In this assignment, we were asked to decorate a paper lanter with our zodiac symbol and a phrase of good luck for the new year.